Where do you eat when you’re only in town for a few hours? Easy, writes Elisabeth Knowles. Go where the recommendations point you, and you won’t be disappointed. When I told people the AT team had a stop-over of a few hours in Darwin on the way back from our last issue’s cover shoot at El Questro, more than one friend suggested we have dinner at Hanuman, the Asian-inspired restaurant that has been a local favourite since it opened in 1992. I figured if the name kept coming up, there must be good reason, so I booked a table for four before we left Sydney. Fast forward a week. Even though we’ve just spent four sweltering days in the Kimberley, Darwin’s humidity hits hard. Before dinner, we take a walk to the harbour so by the time we get to Hanuman, we are aching for a long cold drink. Hanuman is divided into two halves. 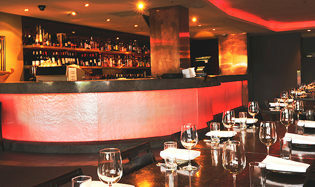 Inside is a sleekly sophisticated room with dark décor, a low ceiling, charcoal-coloured walls and a red neon bar. Indoor diners appear better dressed than we are, and a lot less sweaty. Outside, meanwhile, has a vaulted corrugated iron ceiling, deck-like floor, plantation-style shutters that open onto the street and, thankfully, ceiling fans. It’s an airy, casual space much better suited to the four of us, who, to be honest, have lost our lustre thanks to spending the morning travelling first by 4WD to Kununurra then plane to Darwin. We are tired, hot and hungry, and still have the Sydney leg to go. As we eye off the menu, I’m delighted to discover the house vodka is my favourite, Wyborowa, a rye-based Polish vodka that’s so smooth you can drink it straight. I have mine in a tall chilled glass, with tonic, while I study the menu. Chef Jimmy Shu has designed an impressive array of dishes, which combine Thai, Indian and Nonya (Chinese Malay) influences. The one thing all those cooking styles have in common is their intense, spice-driven flavours. Jimmy’s cuisine has translated so well to the northern Australian climate that he also has another Hanuman restaurant in Alice Springs. We order two entrees – Nonya Pork Rolls, flavoured with Chinese five spice and wrapped in bean curd sheets with a delicious soy tamarind dipping sauce, and Trumpet Mushrooms. Oven-baked in a clay dish and topped with fresh chilli and Asian parsley, they are simple and succulent. Although there are four of us, we decide to go with five mains – why not? We share a red duck curry, red lentil dahl, Kang Kong greens, pork belly and jewfish fillets. While a friend swears you should never consume beasts from the air, land and sea in the same sitting, the mismatch of our meal turns out to be the greens. There are just too many flavours going on in this dish at once, and they clash with the heartier choices. The other dishes are superb. The jewfish is fresh and the broth light and fragrant. The pork is crispy and fatty, just the way you want it. The table favourites are the duck curry casserole punctuated with sweet blasts of lychee and pineapple, and the rich, full-flavoured dahl. We’re absolutely stuffed by the time we get through all the dishes, but the desserts look so good that we order two anyway. The black rice brulee is a sticky-rice style dessert topped with caramelised custard – very sweet. The lemon and lime curd tart is surprisingly subtle, but its berry compote accompaniment adds intensity. Speaking of intensity, I’ve over-indulged. My belly is full to bursting point. Luckily, I’ve got nothing to do but sit back and digest all the way to Sydney. Great food and a nice ambience. If you’re going on a date I Darwin, sit inside – it’s quieter, darker and more intimate. But if you can, get a gang together so you can order more dishes, get rowdy and share at an outdoor table. Where: Hanuman, 93 Mitchell St, Darwin. Notes: Dinner seven days a week from 6pm. Lunch Monday to Friday from 12-3pm.